Fingerstyle guitarist Duck Baker is devoted to a wide range of musical styles, from traditional Irish and Appalachian fiddle tunes to ragtime, blues, gospel, swing, and modern jazz. His originals reflect the influence of the great jazz pianist/composers, and his state-of-the-art acoustic guitar work will appeal to jazz fans, guitar fans, and anyone else who enjoys an evening of superlative music. 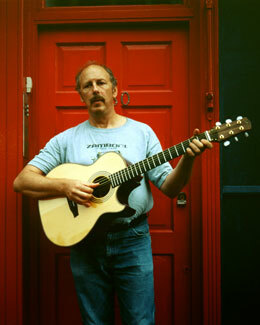 Now residing in London, Duck grew up in Richmond, Virginia, passing his teenage years in rock and blues bands before becoming interested in acoustic blues. From there, he quickly broadened his scope to include many of the roots and offshoots to be found in traditional American music. Over the years, Duck has collaborated with numerous acclaimed musicians, from fingerpicking icons like Leo Kottke and jazz master Jamie Findlay to free music luminary Eugene Chadbourne and Irish fiddler Kieran Fahy. Duck's most ambitious record, Spinning Song, got rave reviews and helped establish Baker as an important voice in the world of fingerstyle jazz guitar. Acoustic Guitar magazine dubbed it "one of the best guitar records ever recorded - by anybody." Duck recently released not one but four new albums, ranging from the free jazz of Everything That Rises Must Converge to the ragtime, blues, and swing of The Roots & Branches of American Music.